On October 5th, 1962 – more than 50 years ago – the Beatles’ first major hit song was released, “Love Me Do.” It was recorded by the famous group during some of their first sessions at EMI’s Abbey Road studios in London during June and September 1962. EMI was then regarded as one of the most prestigious recording companies in the U.K., and the Beatles, through the persistent efforts of their manager, Brian Epstein, were fortunate to even have had a chance with EMI. “Love Me Do” was also among the first of the “Lennon-McCartney” hit songs – those written jointly by Beatles’ singer-songwriters, John Lennon and Paul McCartney. In this case, “Love Me Do” had originated in 1958 from Paul’s schoolboy song scribblings – something both he and Lennon did in their dreaming about musical stardom. Beatles’ 1962 hit “Love Me Do” on Parlophone 45rpm label, produced by George Martin. Click for digital. In any case, the song would rise on the British music charts during October and November 1962, reaching No. 17, making it the Beatles’ first Top 20 hit. However, the song wouldn’t officially arrive in the American market until late April 1964. But for the Beatles, that wasn’t even a consideration at the time. They were just thrilled to have their first major recording. Brian Epstein, Beatles manager & Liverpool record store owner. “Love Me Do” – with “P.S. 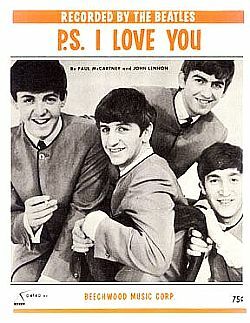 I Love You” on the B side – became the Beatles debut single in the U.K. The song’s production had the guiding hand of George Martin, then manager of one of four record labels at EMI, his being Parlophone, on which “Love Me Do” first appeared, as shown above. Martin, however, had not produced much pop music, though he had done well with some show tunes and comedy recordings, and had also worked with artists such as Shirley Bassey. The Beatles wanted to record their own material, something which was almost unheard of at that time. George Martin would help them do that, but not initially, as Martin had been schooled in the “Tin Pan Alley” tradition where outside professional writers provided the songs for performers. “Tin Pan Alley” refers both to an actual area of New York city where a concentration of professional writers and music publishers worked, and also to that particular style of music business and production, found in other major cities as well. George Martin had first met with Beatles manager, Brian Epstein, in February 1962, after putting him off repeatedly. Martin listened to a tape the Beatles had recorded at Decca, one of several recording labels which had turned down the group. Martin found the Beatles’ tape “rather unpromising,” but he liked the sound of Lennon and McCartney’s vocals. After another meeting with Epstein in May at the Abbey Road studios, Martin was impressed with Epstein’s enthusiasm and verbally agreed to sign the unknown Beatles without having met them or seen them play live. Turns out, EMI wasn’t gambling much on that commitment, as the terms offered were decidedly in EMI’s favor. A first audition came in June 1962, with the arriving Beatles described as being “in awe” of the studio. That audition yielded a tape that Martin – who had not been at the session – listened to at the session’s end. He found their original songs lacking, and also lectured them about what it would take to make it, during which they listened politely and were silent. Acknowledging he was a bit harsh on them, Martin then asked if there was anything troubling them, or if there was something they were not happy with, to which George Harrison replied, “Well, there’s your tie, for a start.” That remark, reportedly, became a turning point for Martin, as John Lennon and Paul McCartney joined in with jokes and comic wordplay as well, which made Martin think they should be signed for their wit alone. He would later say that it was the Beatles’ “cheeky charm” that won him over. Martin would also later acknowledge that Brian Epstein was key to the Beatles’ signing at EMI and their early success. “Individually [the Beatles] may have written and published a few songs,” Martin would say of the Beatles without Epstein’s early help. And they would have been very popular in Liverpool. But without Epstein, Martin believed, they wouldn’t have risen to worldwide fame. “His faith [in the Beatles] never wavered.” Epstein, who was also from Liverpool, had discovered the Beatles through his work at the family business, North End Music Stores (NEMS), which he had turned into a top regional record retailer, and later, through NEMS Enterprises, managed other artists as well. Tragically, Epstein died of a an accidental barbiturate sleeping pill-and-achohol combination in August 1967 at the age of 43. The Beatles at work, EMI studios, Abbey Road, London, England, Tuesday, 4 September 1962. From left: Ringo, George, John and Paul. Photo: Dezo Hoffmann. At the time of the Beatles’ first sessions at Abbey Road, Martin wanted the group to record “How Do You Do It?,” a song written by Mitch Murray and Peter Callender — a song that had been offered to British teen star, Adam Faith, but rejected. The Beatles rehearsed the song, but weren’t thrilled about recording it. However, Martin told them unless they could write something as commercial as “How Do You Do It?,” the Tin Pan Alley formula of using outside material would prevail. So the Beatles recorded it along with a few of their own songs. Sheet music, "P.S. I Love You". Although Martin would be proven right about “How Do You Do It ?” – which later became a hit for Gerry and the Pacemakers – in the end he allowed the Beatles’ own material to go out on their first single, with “Love Me Do” being the primary tune. A part of the sound that distinguished “Love Me Do,” however, and one that would become a part of the Beatles’ early trademark on several of their early songs, was the harmonica – played by John Lennon. Some accounts credit George Martin with urging that the harmonica be used in the song, while others report that it was the harmonica sound that had attracted Martin to the song, and was already part of how the Beatles had been performing it in the clubs. Lennon had learned to play the harmonica after his Uncle George gave him one as a young boy. U.K. poster for June 21,1962 concert with Bruce Channel and The Beatles. But in 1962, around the time the Beatles were recording “Love Me Do,” there were two popular songs out with harmonica parts that had caught Lennon’s attention – “Hey Baby” by U.S. singer Bruce Channel (No. 1 U.S. March 1962) and “I Remember You” by Frank Ifield (No. 1, U.K. July 1962). Top half of U.K. “Mersey Beat” front page, January 1962. Copyright, Bill Harry. “Love Me Do” rose on the U.K. music charts within days of its release, with sales initially concentrated in and around Liverpool, the Beatles’ hometown, and where they had also received the attention of a music newspaper named Mersey Beat, published by Bill Harry. Liverpool was also home to the Beatles manager, Brian Epstein, who owned record stores there. In fact, rumors have persisted over the years that Epstein had bulk- ordered some 10,000 copies or more of the song to increase its chart ranking. Yet some of the Beatles, including John Lennon, denied that happened. Bill Harry of Mersey Beat also wrote a piece in his paper explaining how chart computations were made and why he found the charge without merit. “Love Me Do” did well on regional U.K. music charts, including a No. 1 showing at Mersey Beat. It also appeared on other U.K. charts, including New Musical Express (NME), Record Mirror, and Disc. Melody Maker was also an important chart in the U.K, and one of the longest-running. “Love Me Do” entered that chart on November 27, 1962 at No. 48, eventually rising to No. 21, remaining on that chart life of sixteen weeks. U.K. music critic Ian Mac- Donald found that “Love Me Do,” with its working- class sound, “rang the first faint chime of a revolu- tionary bell” compared to Tin Pan Alley fare. On December 20, 1962, “Love Me Do” peaked at No. 17 on the Record Retailer chart. The Record Retailer was the trade publication the U.K. record industry regarded its official publication, and its music chart was compiled by the British Market Research Bureau and used by the BBC. Meanwhile, back in the recording studio, on November 26, 1962 the Beatles and George Martin re-recorded “Please Please Me,” a John Lennon tune. Lennon and McCartney had besieged Martin to record and release another of their original songs. Martin agreed, and appears to have played an important role in changing the song for the better, as he had them speed up what initially had been a slow ballad. “Please, Please Me,” released in January 1963, hit No. 1 on some of the British music charts February 22, 1963. Other hit singles followed. “From Me To You,” for example, hit No. 1 on May 2 1963, holding there for seven weeks. The Beatles’ first U.K. album – titled Please Please Me – came out in April 1963 and within a month was the No.1 album, remaining in that position for 30 weeks. A second U.K. album — With the Beatles — came next. From then on, there came a string of more No. 1 U.K. Beatles’ singles – at least eleven more by one count – and more No. 1 albums as well. Martin Creasey’s 2011 book on the Beatles’ UK tours. Click for book. The Beatles’ popularity in the U.S., however, would lag behind the U.K. somewhat, owing in part to EMI’s own American subsidiary, Capitol Records, whose executives declined to take on Beatles songs in early 1963, saying, “We don’t think the Beatles will do anything in this market.” Lesser known labels, including Vee Jay and Swan then began picking up the Beatles’1963 songs for limited U.S. release, as well as Capitol’s Canadian arm. Still, even with these, there was not much American notice of Beatles music in 1963, although a few U.S. news stories and some TV coverage had appeared about their success in the U.K. But that was about to change in a big way as Brian Epstein had negotiated some Beatles’ TV appearances with Ed Sullivan for the following February. By December 1963, meanwhile, EMI’s U.S. subsidiary, Capitol Records, began to see the light and released “I Want to Hold Your Hand” to the American market. See “Beatles in America” story at this website for 1963-1964 timeline. 1964 U.S. single of "Love Me Do"/ "P.S I Love You" on Tollie Records. Click for original edition. “Love Me Do” – U.S.
By the time “Love Me Do” formally entered the U.S. market as a single in late April 1964, the song was almost an afterthought. By then, America was in full Beatles swoon, as the group had appeared on The Ed Sullivan Show three times, performed live in Washington, D.C. and New York city, and had at least 14 of their songs among the Top 100 on the Billboard music chart. When “Love Me Do” began to enter the U.S. charts in the spring of 1964, it was due initially to sales of imported copies from Canada. On April 27th, 1964 the single “Love Me Do”/ “P.S I Love You” was formally released in the U.S. by Vee-Jay’s Tollie Records subsidiary. A month later, by May 30th, “Love Me Do” was the No. 1 hit on the U.S. Billboard music chart, remaining in the Top 100 for 14 weeks. In 1982, at the 20th anniversary of “Love Me Do,” the song was re-issued in the U. K. in a special 12-inch edition, featuring both versions of the song recorded on September 4th and September 11th, 1962. With the re-issue, “Love Me Do” rose to No. 4 on the music charts, making an even better showing than it did 20 years earlier. In the Netherlands, a 20th anniversary EP was issued featuring “Love Me Do” along with two other early ’60s Beatles’ hits – “Please Please Me” and “From Me To You.” The Beatles by 1982, however, were no longer together, having broken up in 1970. John Lennon was dead by then as well, shot by a deranged fan in New York city in December 1980. Paul, George and Ringo were each involved in solo careers and/or working with other artists. Beatles music, however, was still doing well. Music technology was beginning to change by 1982, as compact discs were then just emerging, though not yet widely available. Beatles music would not be released on CD until the late 1980s, due in part to litigation between the Beatles and EMI. Cover art for the 2012 E-book, “Love Me Do,” by Bill Harry, published by Miniver Press. At the 50th anniversary of the “Love Me Do” single, Miniver Press published an E-book about the behind-the-scenes making of the song, written by Bill Harry, editor and publisher of several Beatles books, a Beatles encyclopedia, and the former Mersey Beat newspaper. Harry was a long time friend of the Beatles, and in the E-book he reveals an inside account of the song’s making and its release in October 1962, including: how Pete Best was replaced by Ringo Starr on drums after the first recording session; the role George Martin played in the recording sessions and his influence on the Beatles; the behind-the scenes persistence, skill and efforts of Beatles manager, Brian Epstein, on behalf of the group; details on the U.K. charting of “Love Me Do;” and several other accounts. Also on the 50th anniversary, there were special celebrations in the U.K. marking the ocassion, including a commemoration of the song and the “Fab Four” in the Beatles’ hometown of Liverpool, England. “Love Me Do” of 1962 was, in any case, the opening salvo in a worldwide Beatles music revolution that would spark changes not only in music, but also in fashion, film and cultural mores affecting millions of people, and generating billions in business activity. Beatles photo, November 1963, Associated Press. Capitol Records 45 rpm of “Love Me Do” via Canada. John Lennon & Paul McCartney working on their music at Abbey Road studios, London, September 1962. EMI ad for the Beatles’ first song, “Love Me Do,” placed in “The Record Retailer and Music Industry News” trade magazine, September 27, 1962. Bill Harry, Love Me Do: Behind The Scenes at The Recording of the Beatles’ First Single, September 2012, Minivera Press. Katie Hickox, “George Martin Signed The Beatles For Peanuts,” What Goes On News (BeatlesNews.com), July 12, 2008. Photos of Beatles at EMI Studios, Abbey Road, London, England, Tuesday, 4 September 1962 — Photographer: Dezo Hoffmann, BeatleSource.com. “Love Me Do,” RateYourMusic.com, Oct. 2012. “The Beatles’ Recording Sessions,” Wiki- pedia.org. Brian Epstein, “Beatles Record At EMI,” Mersey Beat, September 20, 1962 (with note from editor Bill Harry). Bill Harry, “The Beatles Mythology Two: Epstein & The ‘Love Me Do’ Moun- tain,”Triumphpc.com. “Beatles:Love Me Do,” YouTube.com, Uploaded by tukkerenflits, October 3, 2007. “P.S. I Love You (song),” Wikipedia.org. “The Beatles Love Me Do,” When I’m 64, Sunday, September 25, 2011. Bob Spitz, The Beatles: The Biography, Little, Brown & Co., 2005. George Martin, All You Need Is Ears, New York: St. Martin’s Press, 1995. Jack Doyle, “Beatles’ Closed-Circuit Gig, March 1964″( Beatles’ first U.S. concert appearance in Washington, DC & related U.S. theater showings), PopHistoryDig .com, July 9, 2008. Jack Doyle, “Dear Prudence, 1967-1968″(Beatles retreat in India & song trove developed thereafter), PopHistory Dig.com, July 27, 2009. Jack Doyle, “Beatles in America, 1963-1964” (frenetic early years of Beatles’ popularity & music success) PopHistoryDig.com, Sep-tember 20, 2009. Jack Doyle, “Watching The Wheels, 1980-1981” (John Lennon song; his New York “house-husband” years & 1980 shooting death), PopHistoryDig.com, October 19, 2010. Jack Doyle, “The Paul-is-Dead Saga, 1969-1970,”(rumored death of Paul McCartney & Beatles break up), Pop HistoryDig.com, March 7, 2011.